Roper, Geoffrey, Ed. World Survey of Islamic Manuscripts. London: Al-Furqan Islamic Heritage Foundation, 1992-1994. (Hatcher Graduate Z 6611 .I8 W96 1992 v.1-4) Available online via Al-Furqan Digital Library Portal "World Collections"
Ṣafarī Āqʹqalʻah, ʻAlī. Nuskhahʹshinākht: pizhūhishnāmah-ʼi nuskhahʹshināsī-i nusakh-i khaṭṭī-i Fārsī [= Handbook of Persian codicology: an introduction to the study of Persian manuscripts] bā muqaddamah-ʼi Īraj Afshār. Tihrān: Markaz-i Pizhūhishī-i Mīrās̲-i Maktūb, 2011. "Créée en 2006 par Eric Vallet et Anne Regourd, Chroniques du manuscrit au Yémen est une revue du CEFAS consacrée à l’étude des manuscrits. Elle est diffusée exclusivement en ligne, ses articles sont en français et en anglais, accompagnés d’une traduction en arabe. « Manuscrit » est compris dans un sens extensif, sans distinction de période. L’ensemble des disciplines du manuscrit sont prises en compte (édition de textes, codicologie, histoire de l’art, catalogage, numérisation, conservation, etc.). Les n°1 à 18 (2006-2014) sont disponibles sur le site revue.org de OpenEdition." "The GAZETTE DU LIVRE MÉDIÉVAL has been published since 1982 by a group of medievalists from different countries. While bringing together a diversity of scientific interests, they share the conviction that the history of the book ought to encompass all aspects of this outstanding witness of medieval cultural life, and deserves to be treated as an autonomous discipline. They hope to remove the artificial barrier that tends to separate the manuscript and the incunable, and to extend the field of study and reflection to non-occidental civilisations, envisaging eventually a comparative synthesis. The GLM has been conceived of as something more than a newsletter, but different from an academic review. The first half of each fascicle is devoted to short contributions that summarize recent activity in different areas of research, that reflect on methodological problems, or that present points of view on topical issues. The remainder of the journal offers the reader technical notes, short book reviews, a listing of recent bibliography, announcements or summaries of colloquia, seminars and exhibitions, information concerning research and documentation projects, and other news." "The Journal of Islamic Manuscripts explores the crucial importance of the handwritten book in the Muslim world. It is concerned with the written transmission of knowledge, the numerous varieties of Islamic book culture and the materials and techniques of bookmaking, namely codicology. It also considers activities related to the care and management of Islamic manuscript collections, including cataloguing, conservation and digitization. It is the journal’s ambition to provide students and scholars, librarians and collectors – in short, everyone who is interested in Islamic manuscripts – with a professional journal and functional platform of their own. It welcomes contributions in English, French and Arabic on codicology, textual studies, manuscript collections and collection care and management. Papers will be peer-reviewed to maintain a high scholarly level. The Journal of Islamic Manuscripts is published on behalf of the Islamic Manuscript Association Limited, an international non-profit organization dedicated to protecting Islamic manuscripts and supporting those who work with them. For enquiries and submission of articles for the Journal please contact the editor, Prof. Jan Just Witkam in Leiden"
Manuscripta. A Journal for Manuscript Research. Manuscripts of the Middle East. A Journal Devoted to the Study of Handwritten Materials of the Middle East. Leiden: Ter Lugt Press, 1986-1992. Paris: École pratique des hautes études, 1992-2001. "AATA Online is a comprehensive database of over 121,000 abstracts of literature related to the preservation and conservation of material cultural heritage. AATA now includes selected subject-specific bibliographies produced as part of the Getty Conservation Institute's own conservation and scientific research projects or as part of specific collaborative projects in which the Institute is involved." "BCIN, the Bibliographic Database of the Conservation Information Network, is the Web's most complete bibliographic resource for the conservation, preservation and restoration of cultural property." Indexes materials on Islam, the Middle East, and the entire Muslim world from periodicals, monographs, and other collections in European languages. Coverage of important periodicals such as Manuscripts of the Middle East, Manuscripta Orientalia and the Journal of Islamic Manuscripts. Provides full-text access to the archives of core scholarly journals in the arts, humanities, social sciences and sciences. Multidisciplinary, multilingual bibliographic databases, produced by the Institut de l'Information Scientifique et Technique of the Centre National de la Recherche Scientifique (INIST-CNRS) in France, that together index over 4,200 scholarly journals as well as conference proceedings, books, reports, dissertations and theses. Covers the history of the world (excluding the United States and Canada) from 1450 to the present, including world history, military history, women's history, history of education, and more. The database indexes more than 1,700 academic historical journals in over 40 languages back to 1955. An index to scholarly literature on Western art and art history, incorporating journal articles, monographs, essay collections, and conference proceedings. 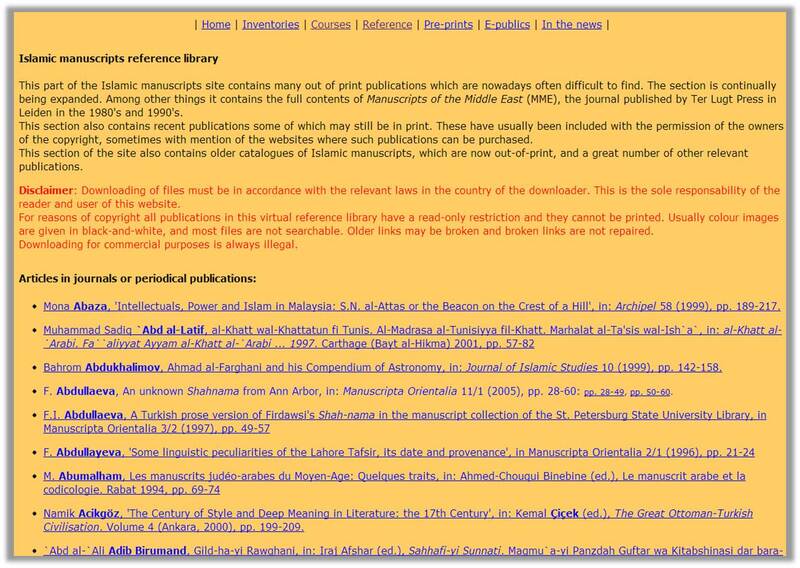 "The Islamic Painted Page database enables you to locate printed reproductions, commentaries and weblinks for thousands of Islamic paintings, including illuminated "carpet" pages, decorated Quran pages, and book bindings from over 230 collections all over the world." Including Brockelmann Online, the Encyclopaedia of Islam (EI, EI2, EIThree), Encyclopaedia of the Qur’ān, Encyclopedia of Arabic Language & Linguistics, etc. Covers all aspects of Islamic art and architecture from the Middle East and Africa to Central and South East Asia. The A-Z entries cover every subject area and theme including artists, rulers, writers, ceramics, sculpture painting, calligraphy, and textiles. “This part of the Islamic manuscripts site contains many out of print publications which are nowadays often difficult to find. The section is continually being expanded. Among other things it contains the full contents of Manuscripts of the Middle East (MME), the journal published by Ter Lugt Press in Leiden in the 1980's and 1990's. This section also contains recent publications some of which may still be in print. These have usually been included with the permission of the owners of the copyright, sometimes with mention of the websites where such publications can be purchased. 1961 edition available for browse and download via MENAdoc. English entries are searchable. Digital version of the famous Hans Wehr dictionary, searchable in Arabic by root. Also available for Android. Fully searchable. Steingass, Francis Joseph. A Comprehensive Persian-English dictionary, including the Arabic words and phrases to be met with in Persian literature. London: Routledge & K. Paul, 1892. Fully searchable. Hayyim, Sulayman. New Persian-English dictionary, complete and modern, designed to give the English meanings of over 50,000 words, terms, idioms, and proverbs in the Persian language, as well as the transliteration of the words in English characters. Together with a sufficient treatment of all the grammatical features of the Persian Language. [Teheran, Librairie-imprimerie Béroukhim] 1934-1936. Julian, Gregorian, Islamic, Hebrew, Coptic, Jalaali, etc. In print, see Wüstenfeld-Mahler’sche Vergleichungs-Tabellen zur muslimischen und iranischen Zeitrechnung, miu Tafeln zur Umrechnung orient-christlicher Ären. Wiesbaden: Deutsch Morgenländische Gesellschaft, in Kommission bei F. Steiner Verlag, 1961. _______. The new Islamic dynasties : a chronological and genealogical manual. Edinburgh : Edinburgh University Press, 1996. Kunt, M. "Ottoman Names and Ottoman Ages." Journal of Turkish Studies 10 (1986): 227-234. See especially "Miniature Painting, Calligraphy & Other Book Arts" and "Museums and Collections"
This systematic bibliography is a work in progress that has its origin in the exploration of teaching projects on the history of the Islamic book in fall 2012.